A bloodstain pattern analyst, also known as a blood spatter expert, collects and analyzes physical evidence—specifically, blood. They examine the location and shape of blood drops, stains, puddles, and pools. But the job doesn't stop there. What Do Bloodstain Pattern Analysts Do? These crime scene technicians are called to sometimes gruesome scenes to gather crucial evidence regarding violent crimes, but at other times, they might only deal with a single blood drop or fingerprint. Trace evidence invisible to the naked eye might be collected using swabs or ultrasonic lighting. Like most other forensic science technicians, bloodstain pattern analysts use their expertise to determine the type of weapon used, and perhaps the direction of travel of a victim or suspect. Bloodstain pattern analysts can determine the trajectory of a projectile, the number of wounds a victim suffered, and how events unfolded during a violent crime. This information can help detectives and investigators determine what kind of situation they're dealing with. Was it suicide or murder? It can provide vital evidence for successful prosecution when the answer is murder. The bloodstain pattern analyst will take photographs and collect samples. Ultimately, she'll write reports and she'll often testify in court, both of which can involve creating computer simulations to clarify and depict the information she's providing. The responsibilities of a bloodstain pattern analyst often include responding to crime scenes and interacting with biohazardous material, such as blood and other body fluids. Exposure is always a danger if proper precautions aren't taken. A typical work shift might technically be Monday through Friday during traditional business hours, but blood splatter analysts can be called out to crime scenes at any time. They can find themselves working at all hours and for long hours. They typically work beside criminal investigators and they work closely with other analysts as well. Most bloodstain analysts are employed by large metropolitan police departments or state-run crime laboratories. 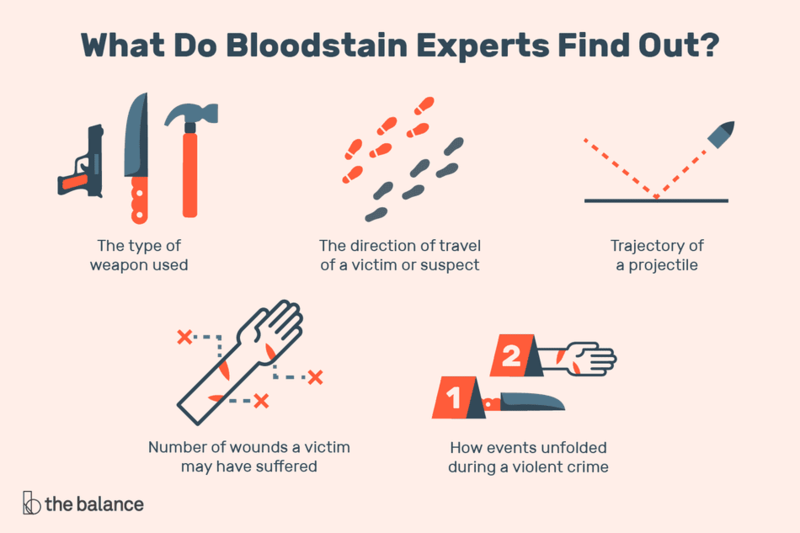 With experience and training, blood splatter experts can sometimes find more lucrative work in the private sector working as contractors or expert witnesses for private attorneys. Bloodstain pattern analysts should have strong backgrounds in scientific studies. A bachelor's degree in one of the natural sciences, such as chemistry or biology, is usually required, according to the U.S. Bureau of Labor Statistics. But you might qualify with just an associate degree if you also have related experience. Additional on-the-job training is pretty common after you're hired. A new recruit typically works extensively and under the tutelage of an experienced analyst before ever handling cases or evidence on his own, sometimes for as long as two to three years. Standardized training in basic analysis has been developed by the International Association of Bloodstain Pattern Analysts. Other advanced training and courses are available as well, and they're recommended as analysts become established in their careers. The International Association for Identification as well as the American Board of Criminalistics offer certifications. Some states require that you certify in their own programs. It can be helpful if drawing and sketching is already one of your strong suits, and possessing some skills as a photographer can come in handy as well. Passing a background check and a drug test is typically required. The growth potential for bloodstain pattern analysts is expected to be high as technological advances and the demand for more accurate criminal investigations increases. The U.S. Bureau of Labor Statistics indicates that projected job growth from 2016 through 2026 is about 17 percent. That's higher than for many other careers. As of 2017, 15,400 jobs were available in this sector and 2,600 more jobs are expected to open up from 2016 through 2026. The median salary for forensic science technicians overall was $57,850 in 2017, according to the U.S. Bureau of Labor Statistics. That works out to almost $28 an hour. Half of all those employed in these positions earn more and half earn less. A career as a blood splatter expert is by no means for the faint of heart or anyone with a weak stomach. But blood splatter analysis can nonetheless appeal to those with inquisitive minds. If you enjoy piecing together puzzles and problem-solving, and if you don't mind the sight of blood, working as a bloodstain pattern analyst might be something you'll want to look into.